INDICATOR 5 Annual expenditures on family planning from government domestic budget. The first applications of family planning sub-accounts, a collaboration between Track20 and WHO, were completed in 2013. Track20 is developing FP2020’s approach for reporting Core Indicator 5: Annual expenditure on family planning from government domestic budget. They are collaborating with WHO, which uses a System of Health Accounts (SHA) framework to provide information for planning and monitoring health expenditures, to develop detailed sub-accounts for family planning. The first applications of the family planning sub-accounts were completed this year. The goal is to have detailed information on family planning expenditures from all countries within the next few years. Information from the first four countries to report data is summarized in Figure 4.19. Total expenditure on family planning in 2012 was US$0.6 million in Benin, US$2.8 million in Liberia, US$6.4 million in Burkina Faso and US$17.6 million in Tanzania. The source of funding for family planning varies widely across the four countries, as shown in Figure 4.19. 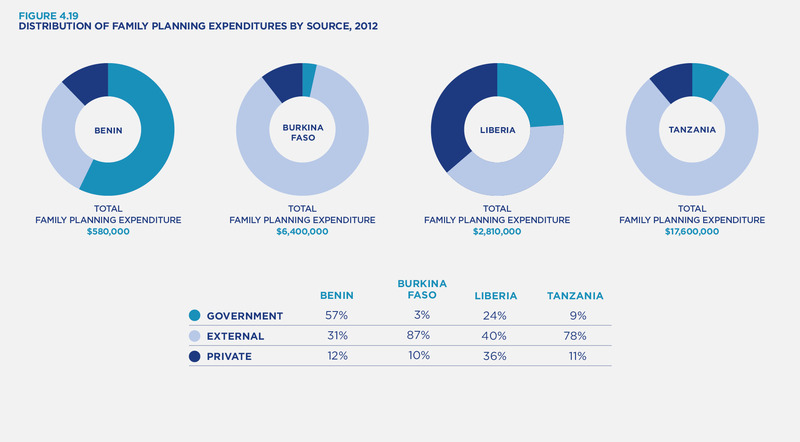 In Benin, the government is the largest funder of family planning services, while external support accounts for 87% and 78% of expenditures in Burkina Faso and Tanzania, respectively. Liberia has roughly equal shares coming from the government, external sources and private funding. The amount of family planning expenditure per user of modern contraception varies from just over $4 in Benin to over $40 in Liberia. 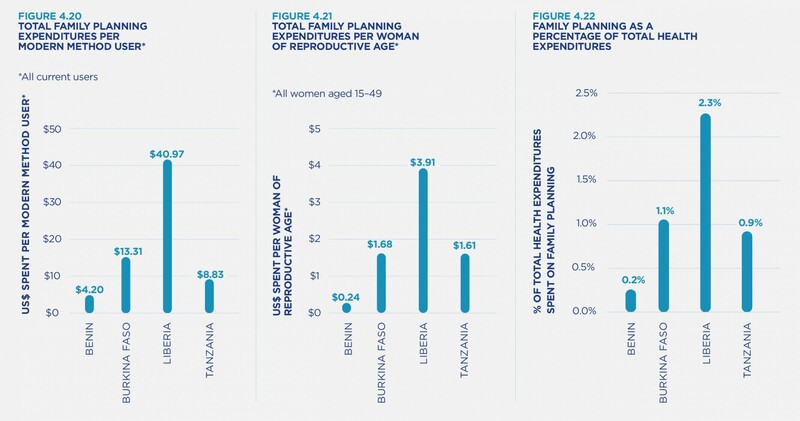 Family planning does not represent a major health expenditure in any of these four countries. The percentage of health expenditure going to family planning ranges from 0.2% in Benin to 2.3% in Liberia.